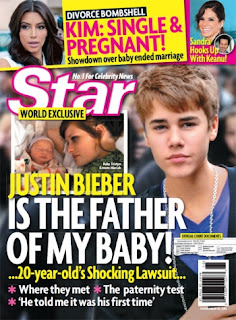 You are here : Home » Breaking News » Justin Bieber, baby daddy? Justin Bieber, baby daddy? His legal team is calling allegations in a reported paternity suit "malicious, defamatory and demonstrably false" and vowing to fight them. Bieber, meanwhile, has told fans he's focusing on other things. Mariah Yeater, 20, made the claim in a paternity suit filed Monday in Southern California, according to Star magazine, which said it has seen the lawsuit and its handwritten declaration from the 20-year-old single mom. A rep for 17-year-old Bieber's legal team Tuesday told outlets including TMZ and RadarOnline that although hadn't yet seen the suit, "We will vigorously pursue all available legal remedies to defend and protect Justin against these allegations." Bieber is currently promoting his new Christmas-themed album and, on Sunday, will pick up one of the inaugural MTV Voices awards at the MTV Europe Video Awards in Belfast, in recognition of his work to raise millions for various charities. He's also recently a multibillionaire -- 2 billion, to be more specific -- in the YouTube page-views department.